“I believe that it is vitally important to see opportunities in our communities, where others may see barriers or challenges. I saw an opportunity in Cincinnati when I walked into an abandoned 4700 s.f. home in Mt. Auburn that was on sale for $40,000 back in 2010. 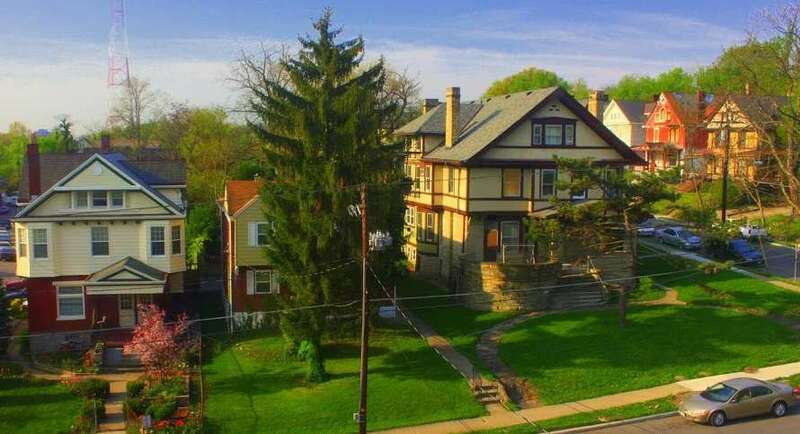 This mansion was built in 1910 by an owner of a lumber yard and must have been a magnificent single-family home for one the richest families in Cincinnati. The walls originally were decorated with ornate hand crafted wooden trims and the house had a whopping total of five beautiful fireplaces, and a third floor ballroom. So why is this beautiful mansion now only $40,000? Before I answer that question, let me share a brief background of Mt. Auburn, which is now a run down, high crime and high poverty rate inner city neighborhood. In the mid-1800’s however, Mt. Auburn was a much different place to visit, crested with people wearing top hats, riding around in horse drawn carriages and shouldering black coats. Mt. Auburn is the closest hill to downtown Cincinnati, so in the mid 1800’s, when downtown Cincinnati was getting crowded, those that had the means moved on top of this hill to escape the inner city crowds. When these barons moved away from the city to Cincinnati’s first suburb, only those with horse drawn carriages were likely to live up this hill as it was a challenging treck in the winter. In the early 1900’s, a street car system was put in place. After more people had access to this hill, they brought along with them the perceived maladies of the inner city. Of course, that meant that the former barons who originally occupied Mt. Auburn moved further away from the city, thus embarking on a trend that continues today as we continually push out the suburbs farther and farther away from the crowded downtown. However, with this move out further from the city, these incredibly wealthy barons left behind their treasures in the form of beautiful old mansions for anyone who wanted to live in their footsteps. Fast forward to 2010, after the â€œwhite flightâ€ of the 1970’s, and here I am, walking through this gorgeous home, once only intended for the richest people of Cincinnati, now surrounded by some of our city’s most vulnerable people. Instead of shaking my head and walking away disheartened, I saw the potential of creating something beautiful in this one small house (or actually, this one rather large house) that would contribute to making this neighborhood a better place to live for all its citizens. 3. Emphasize the importance of tenants being part of their community and to build relationships with their neighbors. On top of that, we decided that all the profits would be re-invested into the community or into the house and that there would be no person monetarily profiting from this social business. Even the loan was obtained at an interest free rate. We decided on all this is because as we all know, those working in the non-profit sector don’t get paid market competitive salaries. Having purchased a home for so cheap, and with 10 bedrooms, rent could only be $250/month and still be profitable to cover all repairs and expenses. Also since non-profit jobs can be challenging, it is important to be surrounded by others who can understand and support them, and living with like-minded folks helps support their day jobs. And as for our third principal of getting to know the neighbors, we believe it is important to establish relationships with others so that if they need help, we would be helping friends instead of serving strangers, which I believe helps foster a true desire to help others. I believe there is room for growth of this idea, to different houses inside or outside the neighborhood, as our strategic vision is to operate intentional communities with different focuses around the city. However, I also believe in organic growth, and that all too often we get in the mindset of, ‘I want bigger, faster, better and I want it all right now.’ Last year, when we had five people applying to a single room vacancy that opened up, I was tempted to expand right away, but we decided that we needed to more firmly establish what we are doing here before growing the house. One thing I have noticed is that in our mobile middle class society, people are coming and going, yet our neighbors stay the same. It is an interesting dichotomy, which I believe has mostly to do with the average age of our residents (~25), but I am interested in seeing how this house or future houses grow and what it becomes 5-10 years down the road and how it will include families as well as young adults. Visit the McGregor House website for more information about this community. For more questions, email the.mac.house.cincinnati@gmail.com.